With a prolific background in electronic music, including being a member of Hercules and Love Affair, Kim Ann is now focusing on a solo career. The next track from her solo push is Return It – House music on a dreamy, modern tip. 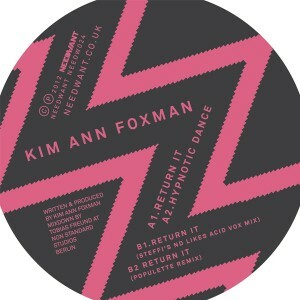 Rich synth layers with Kim Ann’s lush vocals providing a fittingly melodic counterpoint to the solid, jacking low end of the beat. The second original track is Hypnotic Dance that hit you with hazy synths, rolling percussion and driving House bass lines. The beat builds in a slow crescendo to its peak when Kim Ann’s vocal cuts through the layers and lead the melody forward. On the B‐side, Berlin’s Steffi injects a deeper Chicago flavour into her remix of Return It . Steffi’s acid influences are clear and provide a great backing for the vocal in this brilliant remix. New York’s Brooklyn based Populette give their remix a modern feel and instil a strong sense of melody in the track with bubbling bass and synths that work magic on the dancefloor. Another strong package from the dependable Needwant with strong support already way up front on Heidi’s & Scream And Benga’s BBC Radio 1 shows.